Travel is one of my favourite themes for the decor in my home. I love to use vintage maps of places special to me in my interior crafts. A lovely way to use vintage maps is by making upcycled lighting with them. 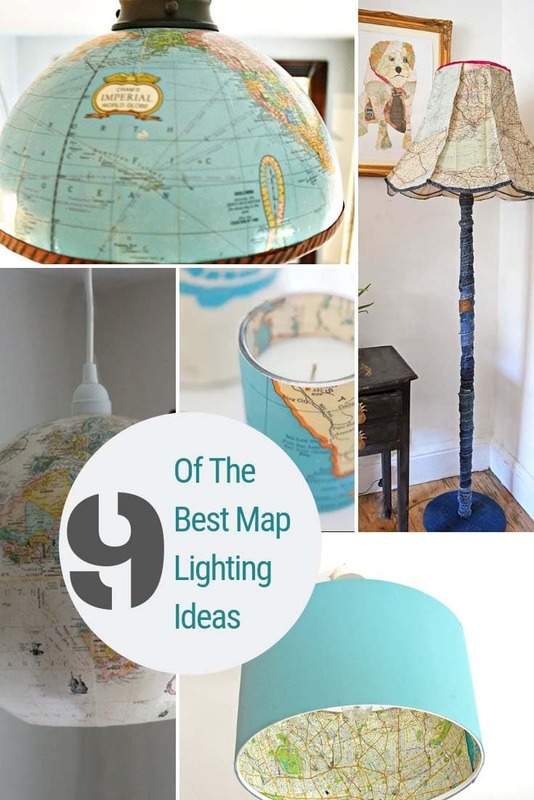 Here I have curated a round up of 9 of the best map upcycled lighting ideas for the home. These range from simple luminaries made from road maps to fabulous pendant world globe lights. 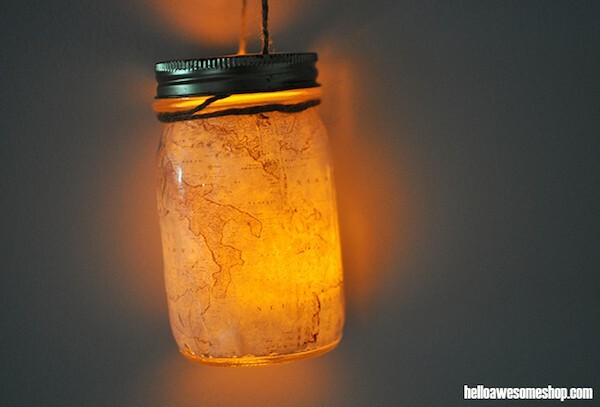 Hopefully, there is a an upcycled lighting idea here to capture your imagination. Maps are a great way to give character and to personalize your home decor. 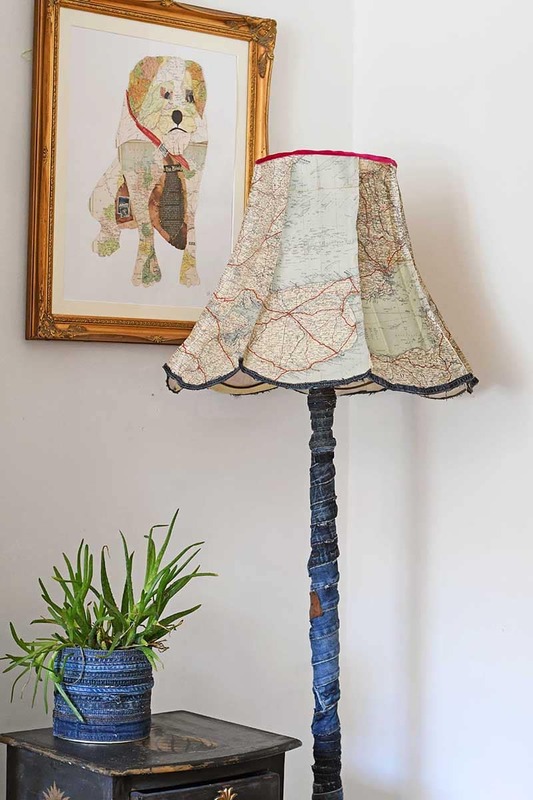 I use maps to decoupage furniture, hang on the wall and to make lamps and lights with. I have even printed my own map pillows. Old road maps are great to repurpose or you can simply download and print vintage maps from the internet. This is one of my most popular posts and has been featured on many sites and magazines worldwide. Probably because it is such an easy upcycled lighting idea. The two map lamps still hang on my ceilings. If you prefer your maps on the outside of your lampshades than the inside. Then this is the tutorial for you! 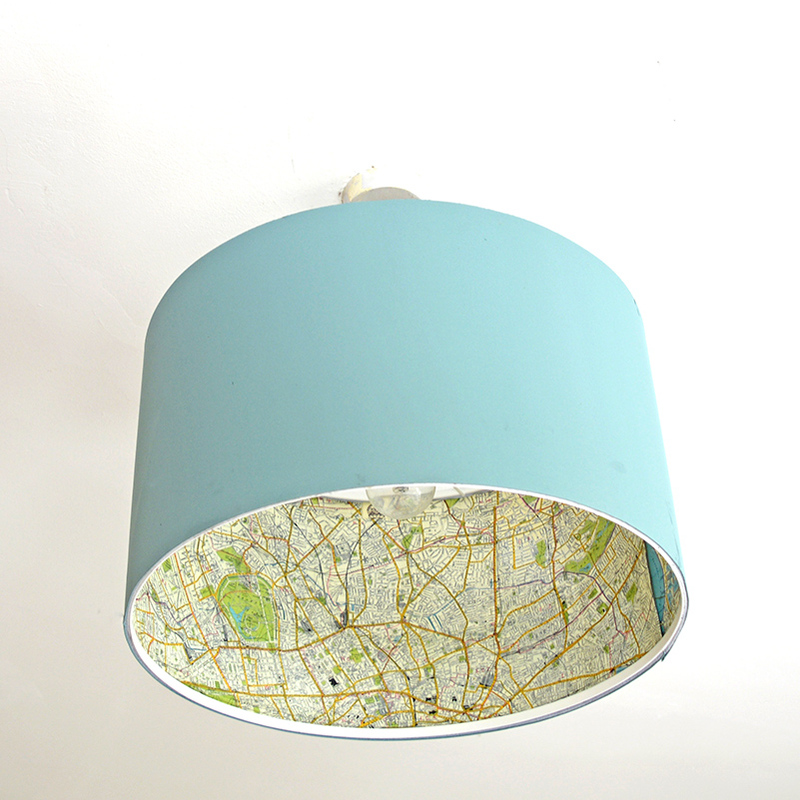 Another upcycled vintage map lampshade but this time a custom made one for a scallop shaped shade. Old road maps where used for this shade. 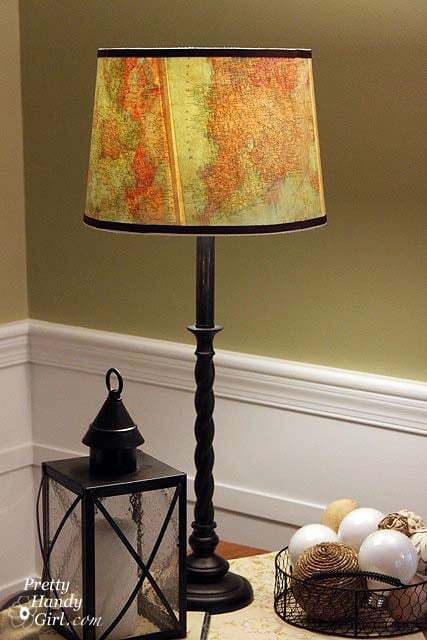 You could make this lamp even more special by using a road map of your favourite place. Even the stand has been upcycled with denim. 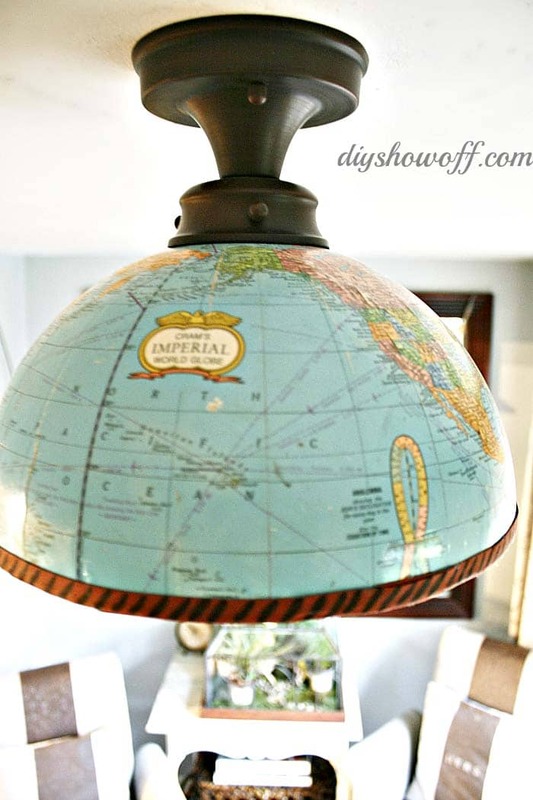 Create fabulous travel themed upcycle lighting for your home by using an old globe. Half a world globe makes a fabulous ceiling light shade. 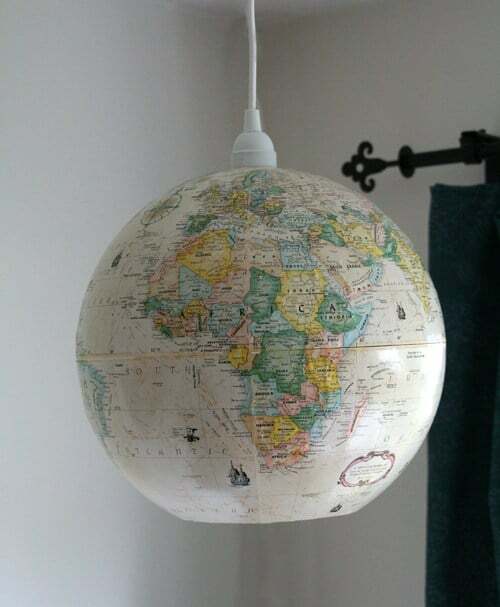 Why not use the whole globe to make a really interesting upcycled lamp for your home. I love a good Mason jar craft. I’ve even made some fabulous Map Mason Jar Banks before. But I never thought of turning them into lanterns until I saw this tutorial. This upcycled lighting idea is another one of mine. I just can’t get enough of crafting with maps! 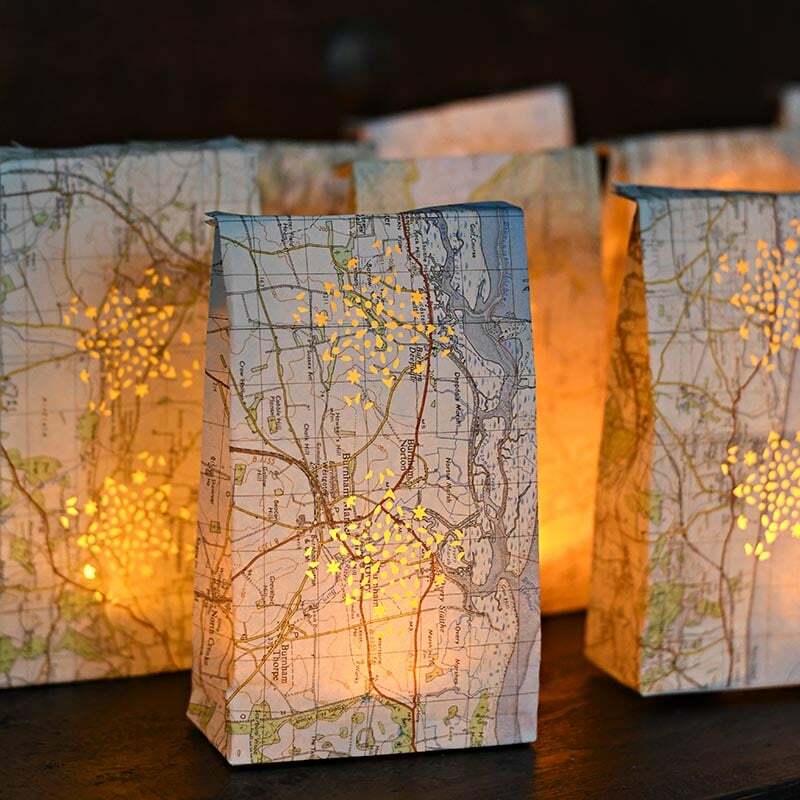 These luminary bags are made with old road maps. The best bit about this craft though are the remote controlled tea lights. This is another simple but effective idea. 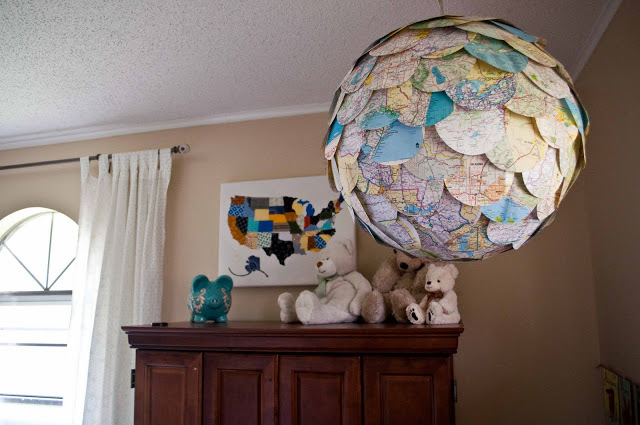 Cut out circles from old maps and glue them to a paper lampshade to create a lovely map pendant lamp. 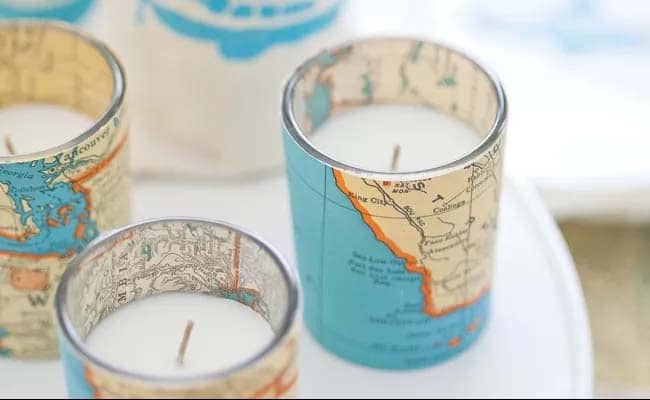 These vintage maps votives were originally designed for a travel themed wedding. However, they would look fabulous in any home especially if you use maps of your favourite places. Which map upcycled lighting idea is your favourite? 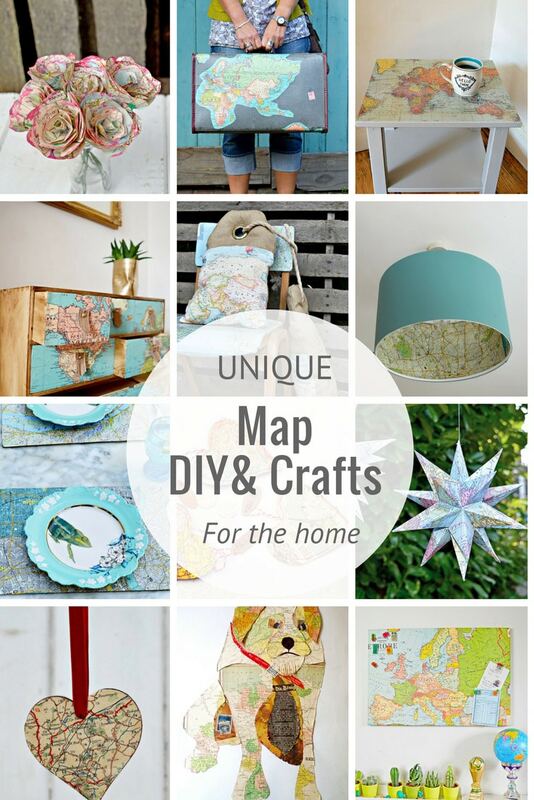 Don’t forget to check out some of my other upcycled map ideas for the home. These are all pretty amazing! I love them and so creative! 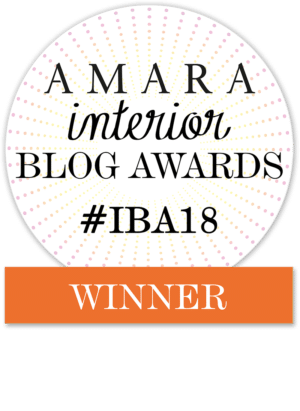 Thank you so much for linking up at Celebrate Your Story! Hugs! I’ve always been a sucker for a creative way to use maps. I love the ideas you’ve collected! Thank you, I have a big pile of maps waiting to be crafted with. I bet your map looks lovely on the wall, a real focal point too! I agree they are all lovely. I love using maps to decorate for that purpose, the meaning they add. These are all fabulous! I love the idea of repurposing maps for lighting. I particularly love the first one and the luminaries. Thanks so much for sharing at Sweet Inspiration! Aww, thank you so much Amy. They are both mine so my favourites too! I like your map crafts. Very creative. I will follow your blog. Thank you for visiting and thanks for the follow. Thank you, Kippi. I think that’s their appeal nostalgia. I love repurposed map projects and these are all wonderful ideas! Would love to make the globe pendant light, sooo cool! Thank you, Linda. I’d love a globe light too, it’s on my list of things to look for.